[/caption] This is one of my favorite spots to cast a view of 5 of the Cascade Volcanoes. You can see Mt. St. Helen’s, Rainier, Adams, Hood and Mt. Jefferson from the crest of this old Fire lookout site. You can also see the tops of Mt. Washington, North and Middle Sister’s. 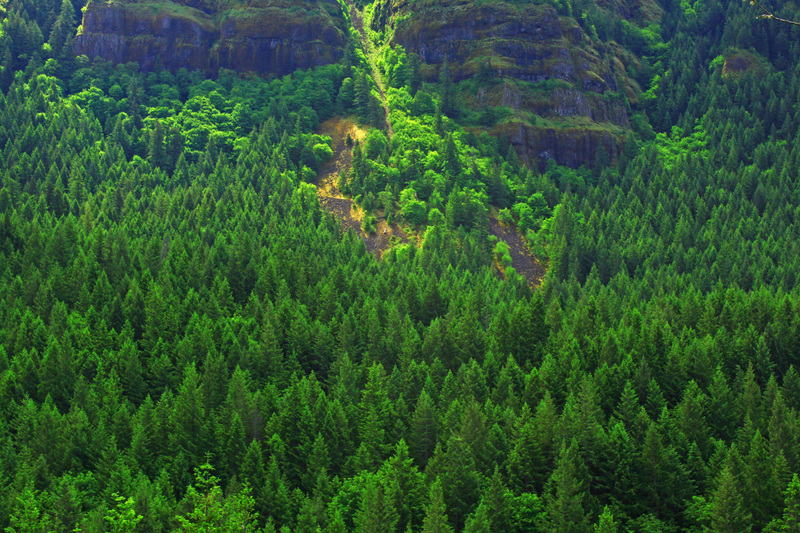 You can see just how spectacular the forest surrounding the Cascades is as well as the intense greenery and solitude that it provides. It’s hard to believe that the forest service was paid to look out from this spot several years ago. The only thing remaining are the concrete steps and a small plaque. 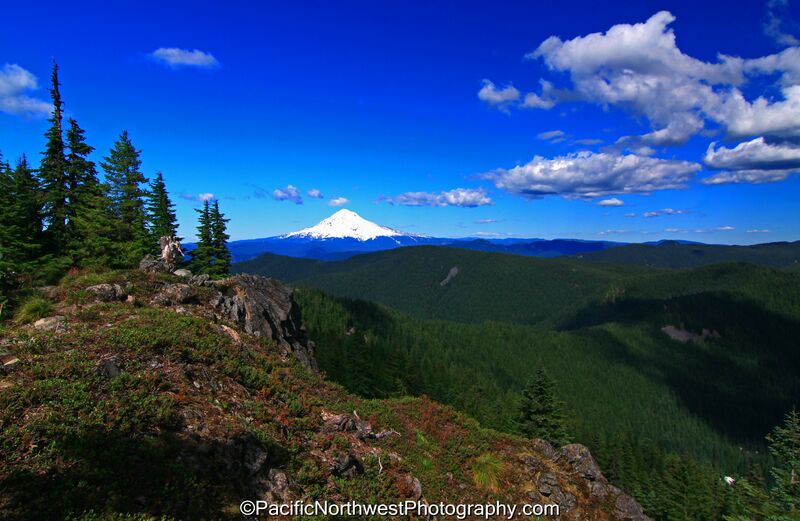 During July and August, several summer flowers grow along the crags and cliff’s surrounding the Western Cascades. This trail is only about an hour drive from Portland but you would never think that it’s that close to civilization. Since the forest road is so remote and the trail is somewhat poorly marked, I have never seen anyone on this trail. This is surely a place to have some peace and quiet. 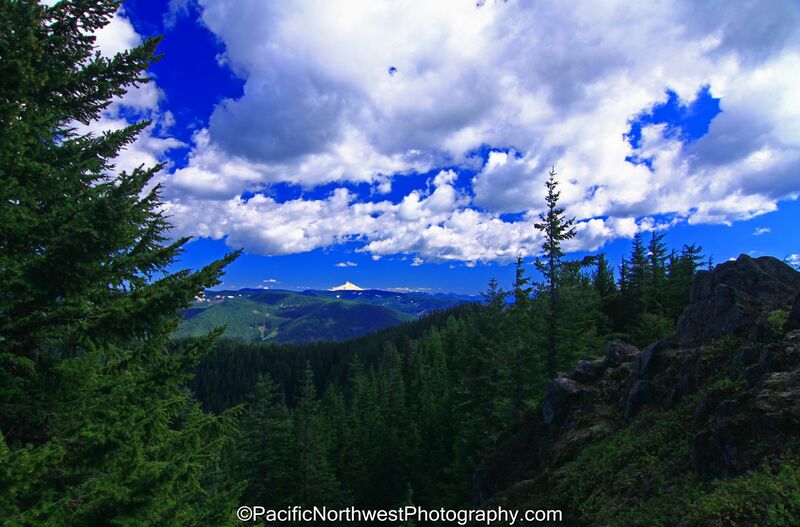 I hiked the trail over the weekend in order to take advantage of the beautiful weather in the Pacific Northwest. I was a little nervous about the sun glare so I started the hike in the later part of the morning, which put me on the top of the summit by about 4:00. The trail to the ridge is only about 4 miles round trip but there are several other trails that zigzag through the Cascades and also to some of the nicest meadows and natural spring lakes. I also ran into several feet of snow along the trail, which really slowed me down. I haven’t seen that much snow during the middle of June since 2007. I was forced to scramble through the snow when the trail was impassable as well as rummage through the thickets. I ended up with some descent scrapes but it was well worth it. I took this shot from near the concrete steps in order to get the crags and fir trees in the foreground and give it more personality. I was using my wide angle lens and had the focal length at 15mm. I had the camera mode set at auto exposure and the ISO at 100. Since I was facing away from the sun, I had to keep the white balance at 0 and the F-stop at 8. I was using my tripod to stabilize the camera since there was just a slight breeze. This is one of those hikes that you could do several times a year without ever getting bored. [/caption] Summer is just around the corner and many of the spring flowers are almost finished for the year. 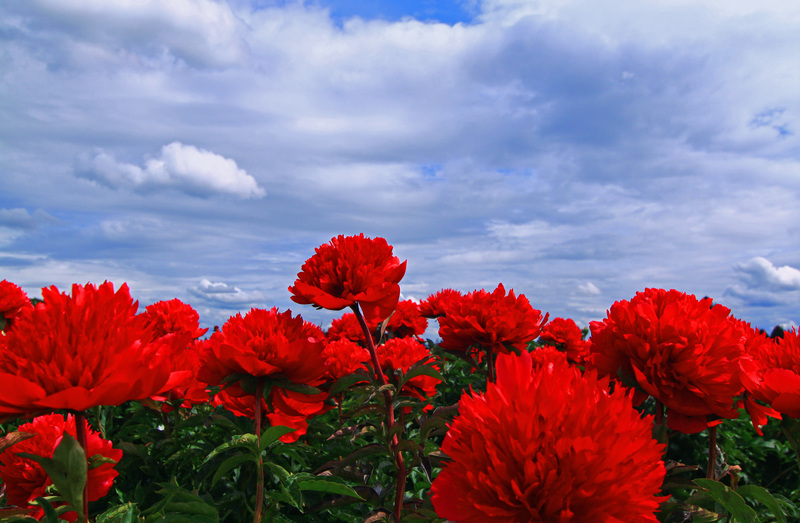 I took this picture at the Adelman Peony Gardens just north of Keizer about two weeks ago. This garden was one of the largest Peony farms I’ve ever been to. To get this photo I had to lay down on my back and set my white balance to under expose the shot. I set the ISO to 100 and had the F stop at 8. I was using my 18-55mm lens and to get this shot I had my focal length at 24mm. I was also using my warming filter in order to bring out the colors of the flowers. [/caption] Thursday was the perfect day to take advantage of the nicer weather by hiking back in to the Gorge and along the Herman Creek Trail. This trail takes you along one of the most scenic trails in the area. You can hear the rumbling of Herman Creek and witness some of the most spectacular tree lined forests around. I keep expecting to run in to Big Foot whenever I’m on this trail. The entire trail is completely covered by a canopy of bigleaf maples and Douglas Fir’s, which is good if it’s raining. There are several areas that expose you to the awesome views of the canyon below and the forest on the other side. You can hear Osprey and Red Tail Hawk’s flying above you. There is only one smaller, less spectacular waterfall on the trail but the overall beauty makes up for that. However, there are several brooks that cut along the trail as well as several photo op’s to take of the creek. Spring and summer flowers grow along the trail whenever it’s near the canyon cliffs. I also always seem to run in to several snakes during the later part of the afternoon. I took this shot just .8 miles from where I parked. This area is one of the best spots to take of the huge basalt and tree lined cliffs that are on the other side of the creek. Because of the intense neon green vegetation and the numerous trees, I always use a tripod. If you don’t, your pictures will almost always come out blurry. The cameras sensor always seems to get confused by all of the greenery and camera shake doesn’t help either. Since the sun was directly in front of me, I set my exposure to just above 0 and had the ISO set at 200. The F stop was at 6.4 and the shutter speed was at 1/83 second. I was using my warming filter along with my CIR-PL. I was using my 18-55mm lens and had the focal length at 39mm. I had the camera set at auto exposure. I highly recommend this hike if your interested in hiking along a tree lined trail and enjoy witnessing some of the most intense colors the Gorge has to offer. There is also a popular campground near the parking area. However, you can hear the noise coming from I-84 and it’s very loud. [/caption] So many people are tired of all the rain that we’ve had in Oregon during the month of May. I however, can’t love it any more. I have seen some of the most colorful and spectacular flowers during the month of May. The roses are stalling a bit but that just means that they will be more vibrant and resilient to the hot weather this summer. The spring flowers along the Gorge and the mountain foothills are amazing. 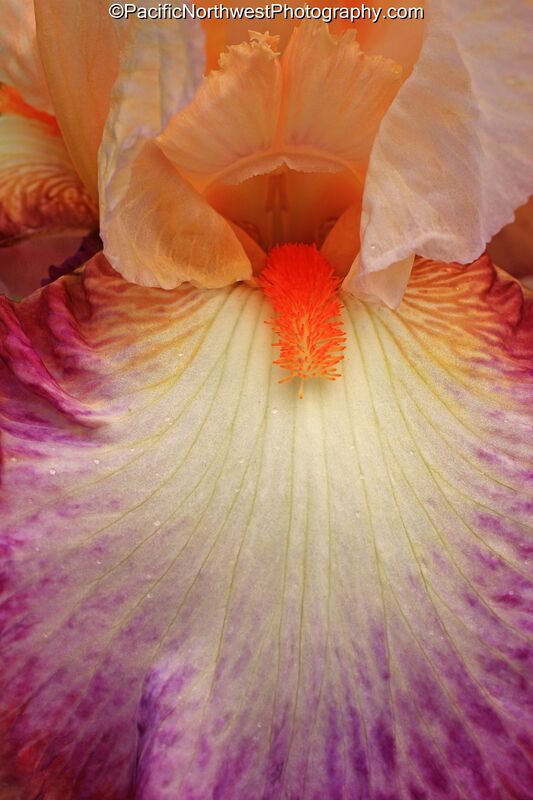 On Sunday I spent most of my day at the Oregon Iris Festival, just north of Keizer. I forgot how many different types of colors there were. It’s pretty amazing how many hybrids they can grow. I lost count after about 20 different colors. They ranged from deep purple to bright white. They also smell like candy and each of them smell exactly the same. They are also one of the most alien looking flowers that I’ve photographed. They kind of look like the creature from the movie “Predator”. The same flower takes on several different images as you move about it. I picked one of them and photographed it 15 times and each time the flower looked different than the previous photo. I used my 50mm macro/prime lens to capture all of my macro shots. I never used a tripod since I am always moving and don’t want to spend all of my time setting up a tripod. I just make sure to remove my CIR-PL and only use my warming filter and the UV filter. The warming filter will ensure a more warming photo and will enhance every color of its subject. The CIR-PL will only make it harder to get a crisp shot since the shutter time needed will increase. To get this shot I set my ISO to 100 and kept the exposure level at about 0. the exposure time was at 1/512 seconds and the F stop was at 8. I was about 4 inches from the flower and I had set the menu to Auto Exposure. I was able to get several shots of the flowers with bumble bees and some lady bugs in the shots. It’s amazing how mellow insects are when you’re working with a macro lens. Now is the time to take advantage of the spring flowers throughout the Pacific Northwest.